While technically (and conceptually) not really part of Data Vault the first step of the Enterprise Data Warehouse is to properly source, or stage, the data. This is a critical step, and often one of the most difficult to get right. It also has direct impact on the core DWH / Data Vault development, or at least supports its core message and principles. This impact can be summarised by the definition that the purpose of the Staging Area (ETL process) is to capture the date/time of a change in a certain entity as accurately as possible. As mentioned in previous posts different Staging and/or delta capture mechanics have different ranges of accuracy and this is always the trade-off with complexity but this is essentially outside the scope of Data Vault. For the purpose of this example the Full Outer Join mechanism is used; other alternatives are CDC, push or pull delta mechanisms using various technologies or storage formats. A lot of solutions / templates are OK as long as they are in alignment with the basic ETL principles and can capture logical / soft deletes. 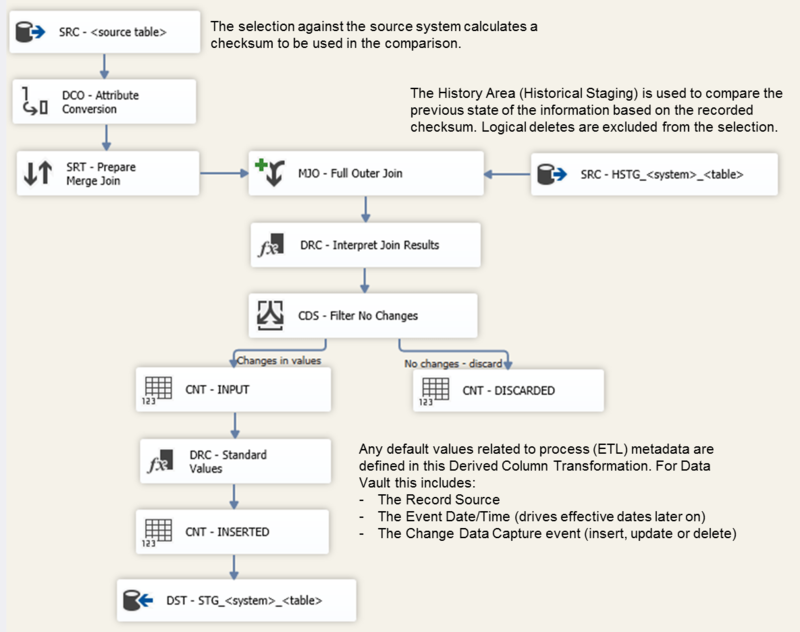 While not part of Data Vault the Staging Area is still a core component of the Enterprise Data Warehouse and is subject to its (architectural) principles including restartability and the ability to process multiple changes in one run (not really applicable for Full Outer Join as it’s a snapshot, but still). SRC – <HSTG table>. The direct connection to the Historical Staging (archive) where all attributes as well as the checksum is queried for comparison. Only the most recent state of each key is selected (maximum Effective Date) and Logical Deletes are filtered out since these do not require comparison (they’re already deleted in the source). The reason the attributes are loaded as well is to support the storage of Logical Deletes following the pattern to record a deleted record in it’s last known state; that’s the information that the Historical Staging provides. CDS – Filter No Changes. The purpose of the conditional split is to remove unchanged records from the Data Flow. If the Change Data Capture event is ‘No Change’ the records are routed to the CNT_DISCARDED (gracefully removed). Otherwise they are routed towards the destination target. This is one of a distinct set of similar approaches towards preparing and staging information for further loading into the core Data Vault model. This process (and its alternatives) serves the purpose of preparing a delta recordset while defining the Record Source and Event Date/Time. The above Data Flow setup can be adjusted for better performance by moving the sorting and data type conversion into the SQL override. If the conversion (DCO) is handled outside the SQL the sorter is required for SSIS to process the record in the correct order for the Merge Join. In this example the conversion is explicit, for demonstration purposes, but this does mean the sorting happens in memory and very likely swap space (tempbuffer).